As a little girl I was always afraid of the dark and in those days, of course, there were no night lights for children. Even now if I close my eyes I am transported back to my Grandmother’s house where I loved to stay, except for that long dark corridor that led from the bedroom where I slept, to the bathroom. What if I needed to go there in the middle of the night? What if I needed my Grandmother if I had a bad dream, as she also slept at the end of that scary corridor? I always thought of darkness as something very frightening. 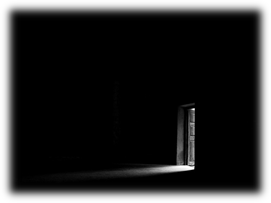 Darkness in our lives is not just a scary, dark corridor. It can take on many forms in our lives. Depression/ broken relationships/addiction/ grief/ failure/ fear itself. Fear of darkness is not unusual, but the darkness that swept over the land on that first Good Friday was unexpected and terrifying! Light was banished for three hours while our Saviour carried the sins of the whole world. But wait! Light was now streaming from a most unusual place… The heavy curtain dividing the Holy of Holies had been ripped in two. Jesus’ death had given us access to the ear of the Father. This first glimpse of light was just a fore runner of the glorious light yet to come. Death and darkness had been defeated. Jesus had already told his disciples that he was “the Light of the world” and even the darkness of the crucifixion was unable to extinguish that light. 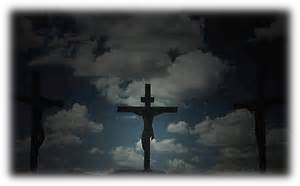 The good news of Good Friday, midst the suffering / pain / and horror was that the chink of light streaming through the ripped curtain was to explode into glorious all-encompassing light, when darkness would be defeated by the resurrection of our Lord Jesus Christ. Your little prayer-“Healer of our every ill, Light beyond tomorrow, Give us peace beyond our fears, And hope beyond our sorrow.”- fits your thoughtful blog. Thanks Jo and Happy Easter to you and the family.